Hamilton Academical welcomes Kilmarnock as part of their 19th round commitment in the Scottish Premiership. The match takes place on Saturday, at the Hope CBD Stadium. Kilmarnock is the 3rd team in league standings and has 34 points from their 18 games so far. They won ten games, drew four and lost the remaining four. The team managed to score 28 goals and conceded 18 in return. Kilmarnock won three of their last five matches in the league, drew one and lost the remaining one. During the time they scored nine goals and let six past their defense. Hamilton occupies the tenth spot in the table and has amassed 13 points so far in their campaign. Their record reads four wins, one draw, and 13 losses. They scored 12 goals and conceded 38. Hamilton lost four of their last five matches in the Premiership. They won the remaining one. Hamilton scored three goals and conceded ten in these five fixtures. Kilmarnock won against Dundee in their last game, at home. The final score was 3-1. Broadfoot and Steward scored the two goals for the home team, while Kusunga added an own goal to the mix. Hamilton lost against Rangers last weekend. The match ended 1-0, in favor of the hosts. Kilmarnock won against Hamilton in their last h2h match. Five of the last six h2h wins belong to Kilmarnock. Nine of the last 10 h2h wins are in the name of the visiting sides. Hamilton won three of their last 16 games. Kilmarnock was unbeaten in 11 of their last 13 fixtures. Hamilton lost six of their eight home-ties. Kilmarnock remained unbeaten in 16 of their last 20 away matches. Kilmarnock is unbeaten against Academical, at this venue, since 2010. Kilmarnock is just two points away from attaining the pole position in the league table. 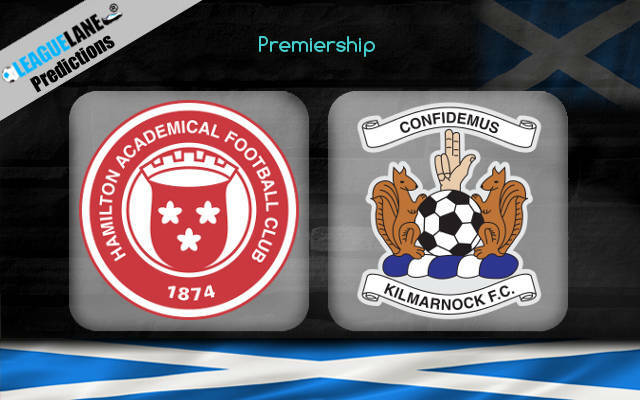 As is always the case, Kilmarnock will look for easy points and goals against the weaker sides in the competition. Hamilton, against whom Kilmarnock has performed well, will find it very hard to survive the tie without a loss. Also owing to the fact that Hamilton is the worst team in the league in the last five matchdays, Kilmarnock will most likely record a win here. Hamilton has conceded the second-most goals in the league so far, and at a rate of more than 2 goals per match. Kilmarnock, who has scored in the last six h2h matches at this venue, in a row, will register at least two goals in this tie. Kilmarnock to win @ 1.80.